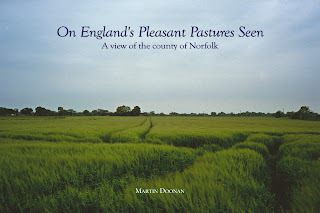 "On England's Pleasant Pastures Seen" is now complete. Pick up the pdf at the SoFoBoMo site linked. 47 images, 55 pages, a mere 4.9MB. Advice for viewing the pdf: view as single pages - it's not designed as spreads - and don't use a zoom of more than 100% as the images are relatively low resolution. Tomorrow I'll put together an actual print version - the layout will probably look at bit strange in the pdf as this one is really meant to be seen as a physical book. What I will be doing is laying out the print version so that the binding is on the bottom edge (which means making a left biding with rotated pages). the idea being that this is a more natural way to view a book of photographs when sat in a chair with the book in your lap. Wow! I am impressed on how you have formatted the book so as to tell a story. I would never have seen this book coming though I saw the individual photos. It brought a smile to my face to see so many of my favourite photos included in the final cut. Thanks. I've just seen it and I like it greatly. As much as your style is different from mine, I really enjoyed your compositions, finding the best of them nothing short of breathtaking. Ummmm. All that green and all that water make me want to visit Norfolk in person, but I enjoyed my vicarious trip. I especially like the divisions of the book and your success in limiting each section to a few well- chosen pictures each of which must do its job effectivly. By the way, I appreciate the size of the download. It was a joy to hit that download button and get almost instant gratification. Furthermore, you are tempting me even more to attempt two books during this month. I look forward to seeing your #2. Thanks for all the comments. I wasn't sure how well the photography would be received as it's not a very obvious view of some of the subjects.